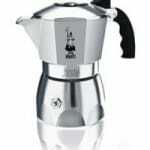 Around here we love touting the benefits of stovetop espresso makers, also known as moka pots. The best stovetop espresso makers cost so much less than espresso makers and although they don’t make true espresso the coffee they make is generally an acceptable alternative to espresso in most drinks. Because moka pots are made from aluminum or stainless steel they are extremely durable and can be used to make coffee while camping over an open flame. We tend to think aluminum pots are the best value for your money and popular models tend to be the easiest to maintain because of the ease of replacing old, aging parts like gaskets and filters. For those looking to buy a moka pot we recommend you stick to one of the five best moka pots featured below or open any of the following pages further curating the list to something you are more specifically looking for (i.e. small, large, or stainless steel models). True moka is served in sizes roughly equivelant to standard shots of espresso. Three servings of Moka is roughly 4.5oz, whichis just a bit more than a double shot from your local barista. If you are making moka for one person at a time then these small stovetop espresso makers are perfect. Since you can’t make a half pot it’s not worth buying a larger moka pot because you’ll routinely have a lot of waste. For those people who really like to drink larger portion sizes then the smallest moka pots will not do. the largest moka pots tend to make between 10-12 servings per batch, roughly 15-20oz. This doesn’t sound like a lot but it’s very potent stuff and usually the large stovetop espresso makers are reserved for small gatherings. Even if you don’t anticipate making large batches of moka very often pots of this size can be big time savers. Typically stovetop espresso maker are made from aluminum. This keeps the price down and improves the conduction of heat around the pot resulting in a brew that is more consistent. With stainless steel however you do get more durability and are better able to clean your pot.. also some people think it’s safer drinking coffee made from steel rather than aluminum. For our customers who are looking for a good stainless steel alternative moka pot these are the one’s we have selected. We have also reviewed the bestselling moka pot of them all – the Bialetti Moka Express. If you are buying one of these then you will be in large company, most buyers go for something super cheap or they turn to the Moka Express. 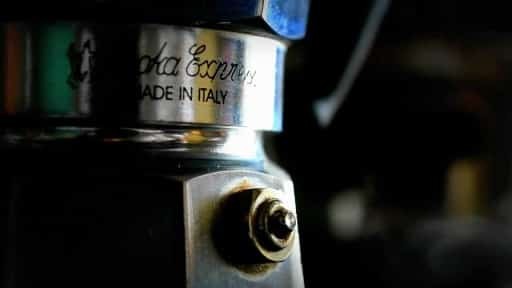 Click through to see our Bialetti Moka Express review here. 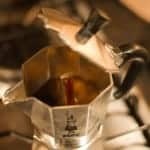 Since you are reading this I’m going to assume you know a bit about stovetop espresso and may want to buy one but if you are new to this brewing method then make sure to see the following artilces which answer common questions people have about moka pots. 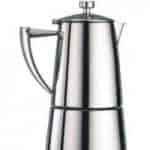 Should I Buy An Aluminum or Stainless Steel Moka Pot? Traditionally moka pots have been made from cast aluminum making them strong yet lightweight and affordable. These days however stainless steel models have become quite popular as many people don’t like their food or drink touching aluminum. 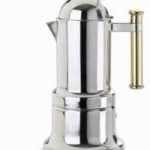 This article breaks down the debate to it’s core issues and answers the most common questions people have regarding aluminum moka pots compared to their stainless steel alternative. When is a Moka Pot Finished? Moka pots make coffee as fast as any other brewer but only if the heat is high enough. To tell if a stovetop espresso maker is done requires you to be close enough to it to hear the last bit of steam gurgle out of the pot or to take a peek under then lid every so often. In this artuicle we help you understand how the moka pot works and know when it’s done making coffee. Does a Moka Pot Produce Crema? The hallmark of good espresso worldwide is the visually appealing layer of crema that forms on the surface immediately after extraction. The crema is the source of all latte art and helps provide texture and aerate the coffee. As you know moka coffee is kind of like espresso but it is brewed under far less pressure. Some people swear they can get small amounts of crema from a moka pot while others say this is a myth. These are our thoughts on the matter. Lastly, check out the following articles comparing stovetop espresso to Aeropress coffee and comparing stovetop moka to true espresso. We believe no one method is better than another, they are all different and have their pros and cons. 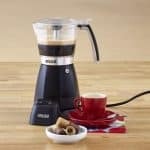 If you are looking for a moka pot that looks a little different than the normal Bialetti then make sure to look at brands like Alessi or Primula. They make great moka pots that make great coffee and look awesome too – like decorations for your kitchen or coffee bar.